Gas Lane was a lane that ran from the junction of Middle Street and Station Road (today's Old Station Road), passing between the Town Gas Works on the west and the railway shunting sidings of Yeovil Town Station and the coal yard started by William Skinner in the 1850s, later Burt's coal yard. The site of the entrance to Gas Lane from Middle Street is now occupied by the former Key Markets House, currently (2014) being converted to a Premier Inn. As it approached the British Rail Parcels Office attached to the railway station, Gas Lane turned to the southwest to skirt the southern boundary of the gas works. It then ran alongside a former wool store that was, during the 1950s and 1960s occupied by scrap merchant EJ Farr. Gas Lane finally exited at Stars Lane, directly opposite Summerhouse Terrace. 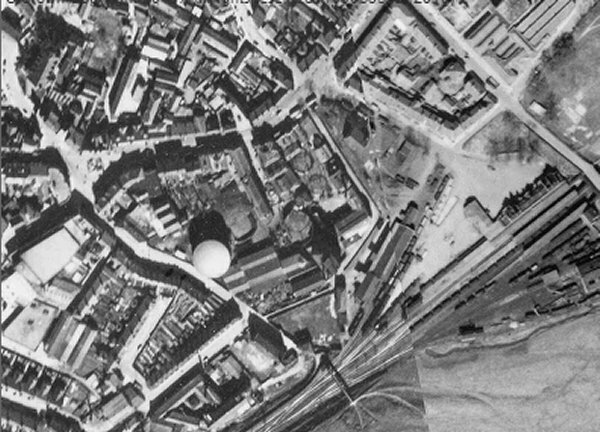 The gas works closed in 1957 and the site cleared in the early 1960s. Gas Lane disappeared with it. 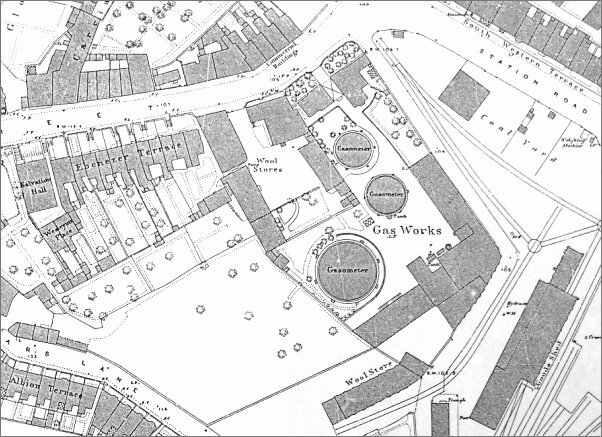 The 1886 Ordnance Survey shows the location and size of the gasworks at this time. Gas Lane starts at top right, almost on the corner of Middle Street and Station Road, runs southeast alongside the gas works buildings then turns southwest. It eventually ran past the building noted as a Wool Store at bottom right of centre (in the 1950s and 1960s this became the premises of EJ Farr, scrap merchant) and joined Stars Lane. 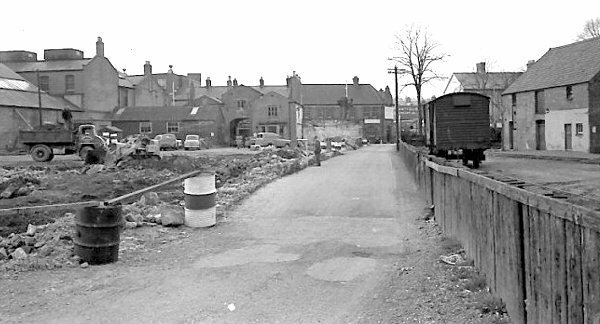 Photographed around 1960 from Central Road, looking across Middle Street with the junction of Station Road (now Old Station Road) at extreme left. Right of centre the three-gabled building was the Town Gas Works offices, originally also accommodation for the Gas Works Manager and his family, (now, after an art deco makeover in the 1970s, converted to the shop of St Margaret's Somerset Hospice). At extreme right the building with the 'Middle Street Centre' sign was the earlier Railway Inn, now the site of the William Dampier. The entrance to Gas Lane was between the two trees at left, the site is now occupied by the former Key Markets House, currently (2014) being converted to a Premier Inn. 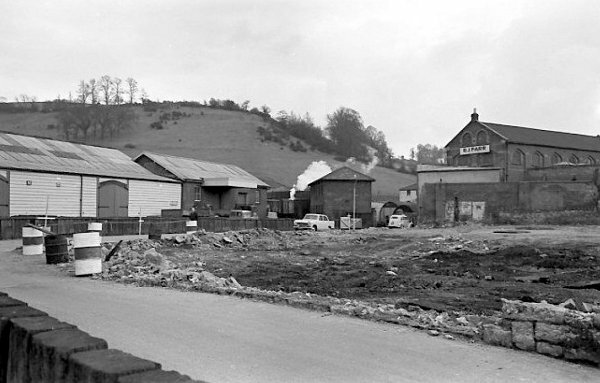 In this photograph the photographer has walked down Gas Lane for a hundred yards or so and has turned around to see the former Town Gas Works offices left of centre and the former Railway Inn directly ahead. At left the gas works have been all but demolished. 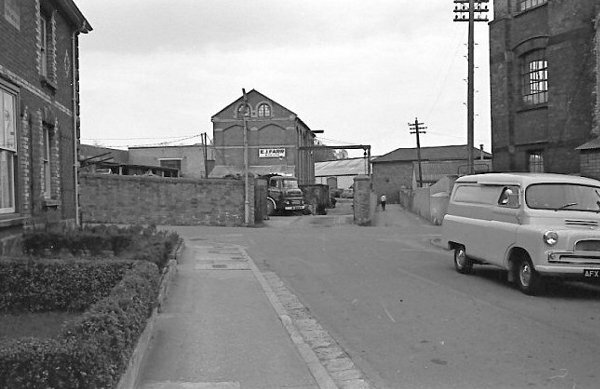 At right a railway wagon sits on the shunting sidings that ran all the way to Middle Street through the coal yard started by William Skinner in the 1860s (it later became Burt's coal yard). The fence running alongside Gas Lane was made of railway sleepers and was used to contain huge heaps of coal. Turning once again to the south, with Summerhouse Hill in the background, the coal yard is at left with more sidings and the British Rail Parcels Office ahead. 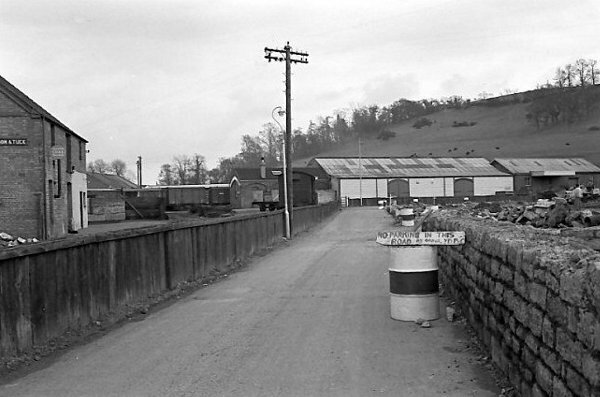 The area occupied by the railway buildings had originally been filled with pens for sheep and cattle but was later used for offloading goods and coal. As it reached the British Rail Parcels Office Gas Lane turned to the southwest. 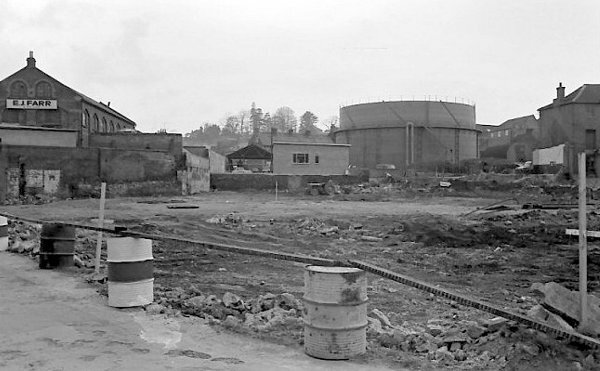 The gas works site has been cleared at right and in the distance at right the large building had originally been a wool store (see the map above) but by this time was the premises of scrap merchant EJ Farr & Co, founded at the end of the nineteenth century by later mayor of Yeovil Ernest John Farr. 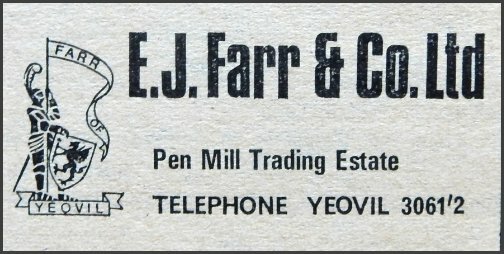 EJ Farr & Co Ltd's advertisement in the 1970 edition of Kelly's Directory indicating that by this time the company had moved premises to the Pen Mill Trading Estate. Having turned the corner in Gas Lane, this view looks west with Farr's building at left and the partially-cleared gas works site at right. 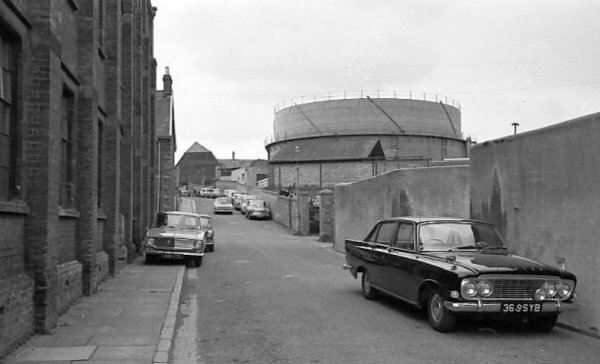 At centre, to the left of the gasometer, are seen the chimneys of Albion Terrace in Stars Lane. 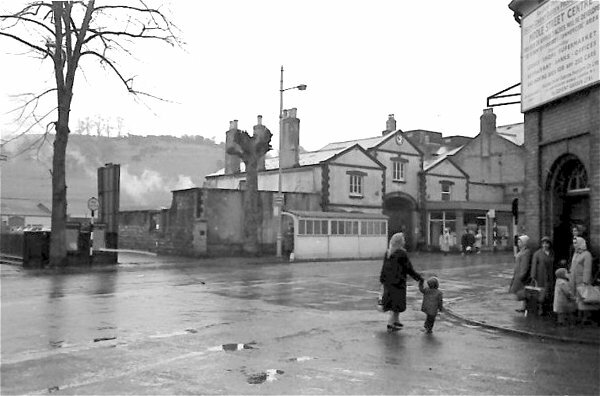 The gas works site would, for many years, become Town Station Car Park. The photographer is now standing in Summerhouse Terrace, with the first house in the terrace at left and Foundry House at right, looking to the junction with Stars Lane running across the photograph. The other end of EJ Farr & Co's building (Ernest Farr had died in 1946) and the entrance to his scrapyard takes up much of centre left while to its right, with the man seen walking along, is the Stars Lane entrance to Gas Lane.